There are 5 of us so I usually make 3 different pans of these (which means I use 3 packages of taquitos). I use glass Pyrex in various shapes to lay them out. Lay the taquitos in bottom of pans. 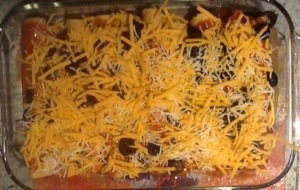 I make one pan with just Taquitos, enchilada sauce and cheese. 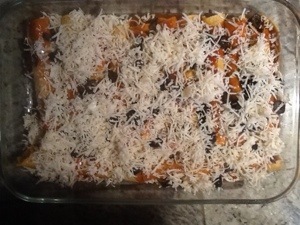 Then one is with everything above and the last pan is with special goat cheese. Yes I have 2 of us that are gluten and dairy intolerant. So after you put down taquitos pour sauce (I use 2 cans for 3 pans) over taquitos enough to cover. Then place cut chives, olives and cheese on and you are done. Bake uncovered for 15 minutes at 350 degrees.